It has to do with blessings of the holiday season. Strength in numbers. And the power of the blogging world as a force of nature. I now have 1,240 followers. 1,240 people who actually have agreed to see an e-mail from me every day in what must be already overloaded e-mail accounts. With views from over 120 different countries. Amazing! I am grateful, to say the least. When I first started this blog, I had to take a time-out from work because of health issues, and I wanted to reach out to people from my home, since I was no longer doing it in an office. My goal was simple – to inspire people, to offer hope, to let them know that they were not alone. To give them the chance to get to know some extraordinary people I’ve met along the way, either through my work, my volunteering, my reading, or my travels. To share a daily quotation that at some point in my life may have spoken to me for a brief moment. Or comforted me. Or inspired. Or challenged. Or teased. Or humbled. And guess what? I was inspired. I don’t know if I achieved my goal for others, but I was certainly inspired by those I’ve met in the blogging world. And the blogging world is simply a microcosm of the real world. Where else can I speak to or read about or cry with people from other countries and other cultures without ever having met them? Where else can I view photos (and very, very good ones, at that!) of hills and meadows, festivals and country markets, colorful flowers and exotic animals, mountain peaks and crashing oceans? Where else can I read about feeding hyenas in Ethiopia or visit a fashion house in Paris or a tiny market on the streets of Pakistan? Or see the purple flowers against the gray stone of a chapel in Ireland or experience the Northern Lights in Norway or read about the politics of Croatia or the struggle for freedom in Egypt as they happen? Or get tips on how to take care of elderly pets or teach a cat how to walk on a leash or get a recipe for soup from Singapore or discuss photography with a retiree in Hong Kong or take notes on the latest fashion from a teen-aged Latvian boy? I’ve offered prayers to people struggling with cancer, sobriety, paralysis, depression and all kinds of loss; exchanged hopeful thoughts in the quiet early morning hours when sleep was elusive; read poetry by young adults in India, Spain and Romania (thank goodness for Google Translate!) 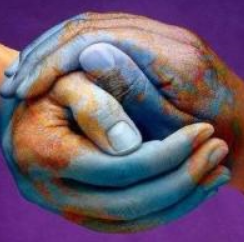 who feel the same things as the rest of us, no matter our age or geographic location; read about different faith traditions practiced in so many parts of the world; and shared my own thoughts about people, with people and for people across the globe. Ask me about how Mumbai’s skyline glitters at night or how the mountains surrounding Islamabad look draped in mist or how the colors of a New Zealand autumn blaze and pop or how the light falls in sacred shadows across an abandoned church in Scotland or how it looks to skydive over Palm Island in Dubai, UAE or how vividly green the terrace farming is in Yemen or how the architecture sings at night in Barcelona. Or how cheetah hunt or elephants grieve or eagles mate or dolphins swim or butterflies migrate. Or how people the world over hate war, how they cry for the same reasons, laugh at silly jokes, help those in need, share food and water when they have little, offer hope when others have none, speak volumes without words in their photographs, allow us to visit inside their homes and hearts, show us their children and plans for the future. We are different; we are the same. We share stories; we share ourselves. We reach out; we touch hearts and hands. We speak in different languages; we speak the same. We harbor faith not confined by religion. We believe and we dream. We inspire and we offer hope. We are present and never alone. A grass roots movement that starts with the 1,240 loyal followers of this humble blog, Soul Gatherings. We’ve already shown that we have more in common than different. We agree – we disagree – – we communicate – we listen – we share – we learn – we care. Let all of us decide the fate of World Peace. One person – one post – one follower – one blog – at a time. We can do this. I can feel it. I can hear our voices, united. This entry was posted in Blessings, Gratitude, Personal Musings. Bookmark the permalink. Very cool idea! How will it work? I haven’t gotten that far yet; I’m hoping to brainstorm ideas at our first meeting of the minds! We can hereby resolve to uphold the peace process anywhere in the world, but this could be merely a very modest beginning. Deep rooted prejudices, greed over resources and territories are really deep rooted in a vast majority of human beings. All we need is one person to start a movement, even for peace. It starts here, with me, albeit I am only one. You already have 1240 with you, and that is a good beginning! I tweeted your post Theresa, it’s a worthy cause indeed. Thanks, Laurie; I knew you would be part of this somehow! Beautiful… also, is that wonderful photo available for purchase? I found the photo searching through aol images. 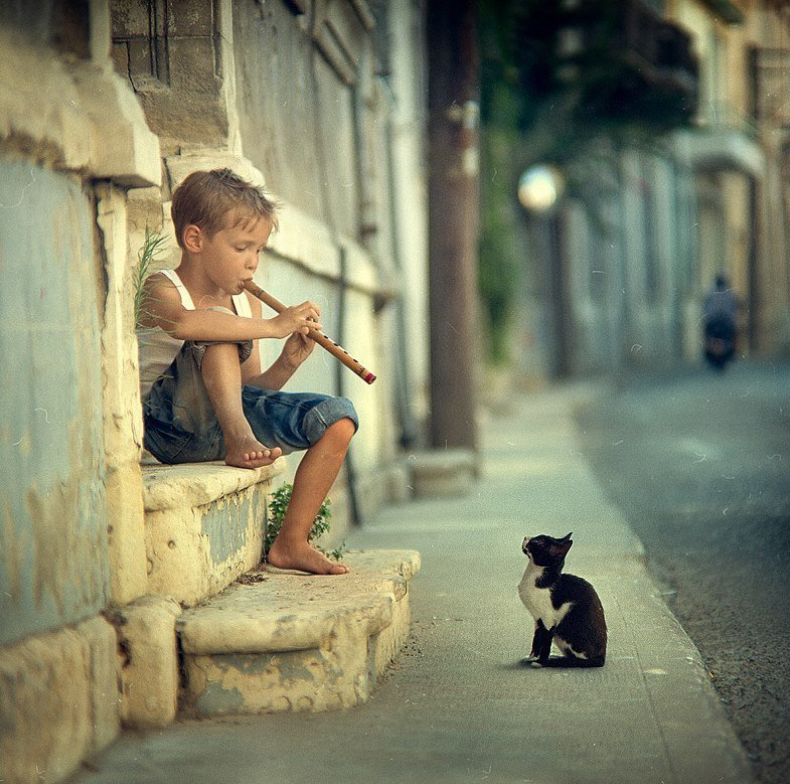 You can also google “cat and boy playing flute image” to find it. Absolutely beautiful. As we walk everyday we have the opportunity to touch others with our kindness, hope, and inspiration ….. your blogging is a wonderful part of that. Thanks Teresa. Am I in? You betcha! Never underestimate the Power of One. You never really know the full impact of your words or actions; if you’re lucky you get some feedback. But there always is an impact, and it has a “ripple effect” as well. We try to do the “right thing” and hope/believe it makes a positive impact. Thanks for your love…I always look forward to that almost midnight hour when your quotes and stories come my way. p.s. feel free to delete the words to make space for more peeps to reply! I am in: wishing for peace for all creatures, big and small. I am in – and you have done much to inspire me with the beautiful soul that you possess, and your exquisite ability to express it. Peace . . .
Once again, you touch my heart with your words. Namaste, my friend. I’m in!! Grass roots beginnings are the best! I think it is brilliant! If there was ever a tool for peace and connecting the people of the world, it would be the internet. Namaste! Jim – you are a poet, and your words touch me deeply. The mirror that is you shines. With blessings and gratitude. Thank you so very much, and welcome!